What is a North Carolina Non-Disclosure Agreement? North Carolina Non-Disclosure Agreement: What Is It? The goal of a North Carolina non-disclosure agreement is to protect confidential business information. Since a North Carolina non-disclosure agreement is a legally binding contract, employees and contractors should sign the agreement before they begin work for a business. North Carolina’s Trade Secrets Act, NC Gen Stat §§ 66-152 through 66-157, governs trade secrets as they relate to non-disclosure agreements. Confidential business information is referred to as a “trade secret.” NC Gen Stat § 66-152 provides a legal definition for the term. It is business or technical information that includes but isn’t limited to formulas, patterns, programs, devices, compilations of information, methods, techniques, or processes with their own actual or potential monetary value. The value is developed because it’s not information that the public or other businesses have access to or that they can figure out through their own development or reverse engineering processes. A business must also take reasonable methods to protect the secrecy of that information. Trade secrets may be owned by one or more persons. North Carolina’s Trade Secrets Protections Act provides civil remedies for misappropriation of trade secrets, including the possibility of punitive damages. The law also explains the evidence that must be provided to meet the burden of proof. 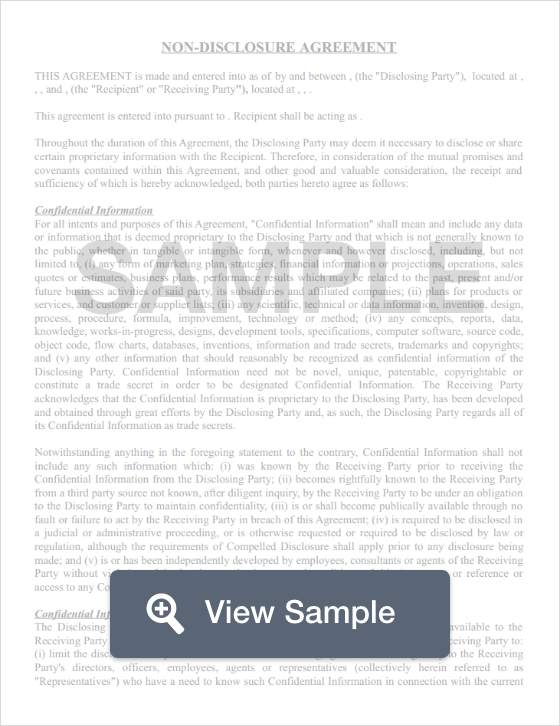 A non-disclosure agreement is just one contract that can be used to protect a business. Businesses should also use a North Carolina noncompete agreement for extra protection.